to BI or not to BI? – poll’s results may correlate with number of Qlikview/Tableau/Spotfire groups (and the size of their membership) on LinkedIn and also ability of employees of vendors of respective tools to vote in favor of the tool, produced by their company (I don’t see this happened). 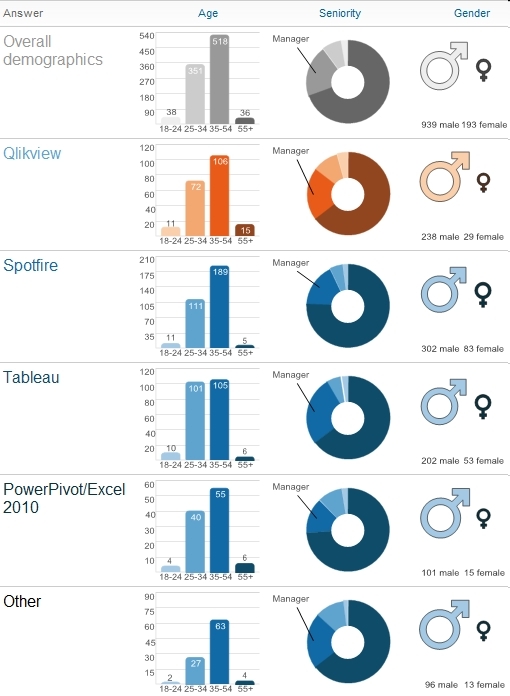 LinkedIn has 85 groups, related to Qlikview (with almost 5000 members), 34 groups related to Tableau (with 2000+ members total) and 7 groups related to Spotfire (with about 400 members total). Randall Hand posted interesting comments about my poll here: http://www.vizworld.com/2011/01/tool-data-visualization/#more-19190 . I disagreed with some of Randall’s assessments that “Gartner is probably right” (in my opinion Gartner is usually wrong when it is talking about BI, I posted on this blog about it and Randall agreed with me) and that “IBM & Microsoft rule … markets”. In fact IBM is very far behind (of Qlikview, Spotfire and Tableau) and Microsoft, while has excellent technologies (like PowerPivot and SSAS) are behind too, because Microsoft made a strategic mistake and does not have a visualization product, only technologies for it. Spotfire fans from Facebook had some “advise” from here: http://www.facebook.com/TIBCOSpotfire (post said “TIBCO Spotfire LinkedIn users: Spotfire needs your votes! Weigh in on this poll and make us the Data Visualization tool of choice…” (nothing I can do to prevent people doing that, sorry). I think that the poll is statistically significant anyway and voters from Facebook may be added just a couple of dozens of votes for … their favorite tool. Among Other Data Visualization tools, mentioned in 88 comments so far were JMP, R, Panopticon, Omniscope (from Visokio), BO/SAP Explorer and Excelsius, IBM Cognos, SpreadsheetWEB, IBM’s Elixir Enterprise Edition, iCharts, UC4 Insight, Birst, Digdash, Constellation Roamer, BIme, Bissantz DeltaMaster, RA.Pid, Corda Technologies, Advizor, LogiXml,TeleView etc. Happy Shopping for your Data Visualization Lab! Datawatch has 3 Vs, does Visualization now! 2 Free Microstrategy Visualization tools Disrupt it all! The BI is a dead horse, long live the DV!